Known in the West as Alhazen, Alhacen, or Alhazeni, Abu Ali al-Hasan ibn al- Hasan ibn al-Haytham was the first person to test hypotheses with verifiable experiments, developing the scientific method more than 200 years before European scholars learned of it—by reading his books. Born in Basra in 965, Ibn al-Haitham first studied theology, trying unsuccessfully to resolve the differences between the Shi'ah and Sunnah sects. Ibn al-Haitham then turned his attention to the works of the ancient Greek philosophers and mathematicians, including Euclid and Archimedes. He completed the fragmentary Conics by Apollonius of Perga. Ibn al-Haitham was the first person to apply algebra to geometry, founding the branch of mathematics known as analytic geometry. A devout Muslim, Ibn al-Haitham believed that human beings are flawed and only God is perfect. To discover the truth about nature, Ibn a- Haitham reasoned, one had to eliminate human opinion and allow the universe to speak for itself through physical experiments. "The seeker after truth is not one who studies the writings of the ancients and, following his natural disposition, puts his trust in them," the first scientist wrote, "but rather the one who suspects his faith in them and questions what he gathers from them, the one who submits to argument and demonstration." In his massive study of light and vision, Kitâb al-Manâzir (Book of Optics ), Ibn al-Haytham submitted every hypothesis to a physical test or mathematical proof. To test his hypothesis that "lights and colors do not blend in the air," for example, Ibn al-Haytham devised the world's first camera obscura, observed what happened when light rays intersected at its aperture, and recorded the results. Throughout his investigations, Ibn al-Haytham followed all the steps of the scientific method. Kitab al-Manazir was translated into Latin as De aspectibus and attributed to Alhazen in the late thirteenth century in Spain. Copies of the book circulated throughout Europe. Roger Bacon, who sometimes is credited as the first scientist, not only read De aspectibus but summarized its findings in part five of his Opus Majus, or Greater Work, referring to Ibn al-Haytham by his Latinized name, Alhazen, and describing his experiments in detail. Ibn al-Haytham conducted many of his experiments investigating the properties of light during a ten-year period when he was stripped of his possessions and imprisoned as a madman in Cairo. How Ibn al-Haytham came to be in Egypt, why he was judged insane, and how his discoveries launched the scientific revolution are just some of the questions Bradley Steffens answers in Ibn al-Haytham: First Scientist, the world's first biography of the Muslim polymath. Midwest Book Review calls Ibn al-Haytham: First Scientist a "fine blend of history and science biography." Booklist concurs, praising Ibn al-Haytham: First Scientist as a "clearly written introduction to Ibn al-Haytham, his society, and his contributions." Kirkus Reviews touts Ibn al-Haytham: First Scientist as "an illuminating narrative...of a devout, brilliant polymath." Children's Literature comments, "Steffens deftly weaves an overview of Islamic history into this biography. Writing for The Fountain, Dr. Ertan Salik adds: "I congratulate Bradley Steffens for his beautiful work about Ibn al-Haytham and his advancement of experimental science." Writing for the Journal of the Islamic Medical Association of North America, Dr. Husain F Nagamia obvserves, "Steffens has the unique ability of a storyteller that makes the reading of his book as interesting as a spy thriller, unfolding the events in Ibn al-Haytham’s life like the clues being discovered by a forensic detective." Critics are not the only ones praising Ibn al-Haytham: First Scientist; casual readers are lauding it as well. In a 5-star Amazon.com review, Haitham Hamad called it a "fantastic book, written in a brilliant manner." In another 5-star Amazon.com review entitled "Little Book - Big Message," Brian Francis Neary wrote, "First Scientist" is entertaining, educational and inspiring. A great read." Abdul Jabbar Al-Shammari, the director of the Ibn al- Haitham Center for Science and Technology in Amman, Jordan, writes: "I enjoyed reading about the events in the life of the first scientist, Ibn al- Haitham. I congratulate Bradley Steffens on writing a fantastic and accurate book.” The blog Skulls in the Stars comments: "Steffens has written a wonderfully clear and concise account of al-Haytham’s life and work." A. Nor of Ohio adds, "I find the book interesting, for it accords and recognizes a Muslim scientist his proper place as the first scientist who is responsible for advocating experimental work in verifying conceived scientific ideas (hypotheses)." And Reformistan blogger Usman Mirza, of Karachi, Pakistan, writes, "As Muslims, we are subject of taunts for our ‘backwardness’ and lack of secular, scientific achievements. 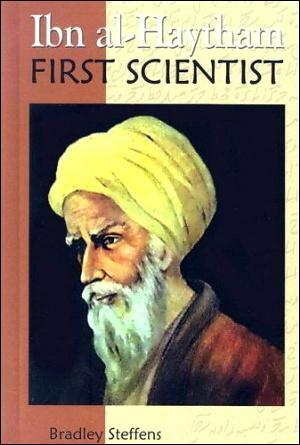 I encourage readers to read a book on the 'first scientist', a Muslim in Islam’s golden age. It is a nicely written biography of Ibn al- Haytham by a westerner, Bradley Steffens. He has written about a neglected subject that needs to be read by all."